Practicing ATV safety can make ATV riding a fun and exciting sport as well as a key element in agricultural work. In recent years ATV injuries and deaths have dramatically increased in the U.S. Improper use of ATV’s can result in serious injuries, therefore it is important to read the manufacturers safe practices and understand specifics about your individual ATV as well as enrolling in an ATV Rider Course which is available free to many new riders. Below is a list of Safety tips to keep you safe on the trails. Not all ATV’s are the same, in fact the wide varieties from one ATV to the next can make it important to be aware of how a particular ATV works before going for a ride. Brake variation—Are front and rear brakes controlled separately or linked? It is important to know the proper technique for stopping a particular ATV. Do you know which type of transmission you are working with and how to use it? Clutches can be automatic, hand operated clutches, foot or hand shifted, or fully automatic. Does the ATV you are using have a reverse gear? How is the Throttle controlled? Some ATV’s are equipped with a thumb lever while others are controlled by twisting a hand grip. Is the ATV designed for single or double occupancy? What is the minimum age recommendation on the ATV’s warning label? A whopping 90% of child related ATV accident happened because the child was too small for the vehicle they were on. The design of vehicles take into account the size, weight, and strength of a user, therefore a child using a model that is designed for someone older will not have the control necessary to operate the machine. Understanding these differences as well as the locations of all the proper controls and switches will make it easier for you to safely handle the vehicle. ATV’s by design can turn over, thus safety gear is extremely important to protect yourself in the case of an accident. It can also provide stability and comfort on a long ride. Always wear a DOT or Snell Memorial Foundation approved helmet. The helmet should fit snug and fasten securely. Whether you are using a full face helmet or open face design, goggles should always be worn. Long pants and a long sleeved shirt will protect your skin. Off highway riding gear is always the safest alternative and provides maximum protection. Gloves and Boots are very important in protecting you in the event of an accident. They can also help to make your rides more comfortable. Gloves are designed to keep your hands from getting tired and sore as well as keep them warm on a cold day. Over the ankle boots with a small heel will protect your lower legs, feet, and ankles as well as prevent your foot from slipping off the foot rests. Always inspect your ATV before heading out to make sure everything is in good working condition. It is also very important to make sure you have a tool kit with you before you head out to ensure you can fix an issues that may arise. ATV’s flip easily so ride cautiously and make sure that you are familiar with the recommended braking and turning techniques for your particular vehicle. 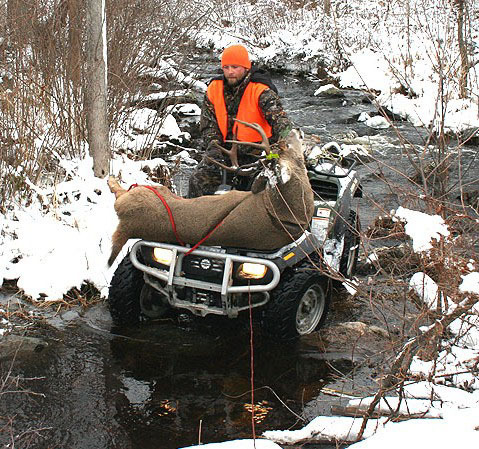 It is also important to be aware of how to handle your ATV on hills and in inclement weather conditions. Always be aware of your surroundings and terrain. Although your ATV can be used on most any terrain there are best practices to be considerate of when in specific conditions such as mud, water, snow and sand. Understanding how to handle your vehicle in certain environments will not only protect you but also extend the longevity of your ATV. Do not overload your ATV or ride with more riders than are recommended in your owner's manual. Never ride on pavement and be extremely cautious when crossing roads. ATV’s are not designed for use on pavement, the additional friction caused by pavement will make your ATV difficult to control, unstable and unpredictable. One of the leading cause of accidents and fatalities is riders improperly crossing roads or using paved roads. Ride in a group or with a partner, the buddy system is the best way to make sure everyone gets home safe. Riders under 16 years of age should always be supervised. Do not drink and drive. Never ride while under the influence of alcohol or drugs. Understand the laws in your area. To get the most out of your ATV experiences follow safety guidelines and understand your particular vehicle. Don’t forget to ride responsibly and try to inflict the least amount of damage to your surroundings as possible. This will ensure that you will always have a place to ride and that the individuals who own or maintain the area will not have a problem with you enjoying it. Resources: ATV Safety Institute “Tips and Practice Guide for All-Terrain Vehicle Rider” Specialty Vehicle Institute of America. 2008.